After two+ decades apart due to an interruption called real life, the universe deemed it was time for a new Jehova Waitresses album. Their fifth release titled Route 5, not only gets the band back together, it lets you hear the full scope of what the band is about. 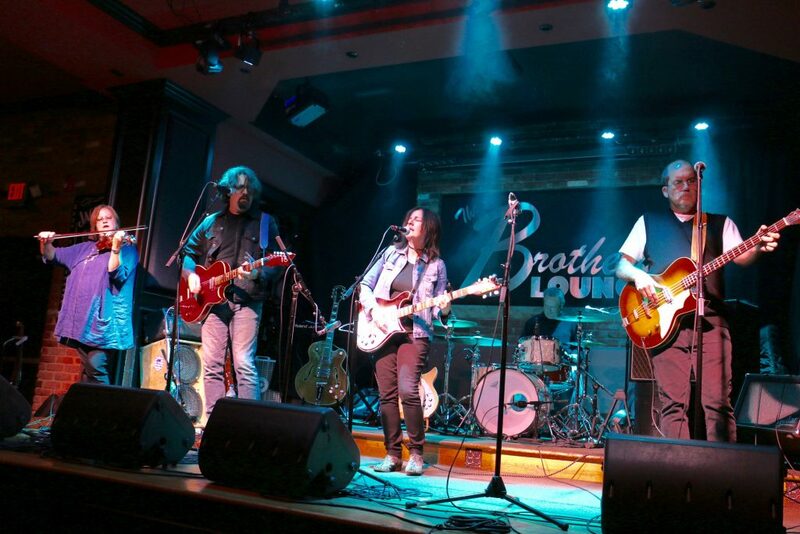 Originally labeled as folk-rock, the truth is their rock roots are there for the taking, along with some additional Americana flavor by way of violin, lap steel guitar and harmonica. Their style is as eclectic as it is both serious and fun. Jehova Waitresses, originally out of Cleveland now East Coast based, is Linda Roy (writer, vocals, guitar, mandolin, banjo, uke, harmonica), Kevin Roy, husband/co-writer/co-conspirator (vocals, guitar), Jeff Harmon (vocals, drums, percussion), Alan Grandy (writer, vocals, bass, lap steel), Janice Fields-Pohl (violin). Also appearing on the album are Rick Shapiro (organ, electric piano) and Mark Addeo (pedal steel). Listening to Route 5, the music speaks for itself, but what about the band name? According to Linda Roy the handle Jehova Waitresses can be traced back to her high school days when an overly attentive waitress reminded her of a religious group known to be a bit relentless. Linda was rewarded for her name creativity when, in 1994, Entertainment Weekly named Jehova Waitresses as the Best Band Name of the year. Their latest release also finds the band’s music as the backdrop to a video which was accepted into four film festivals during this past year. “Mercy Marie,” a song written by Kevin and Linda Roy, takes on a new spin as the storyline plays out in a refreshingly ordinary human narrative. 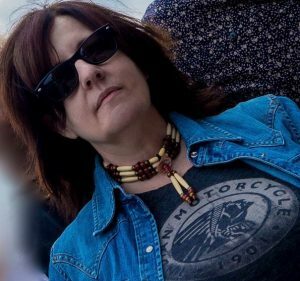 Linda Roy recently spoke to Onstage about Route 5, the long strange trip it’s been, and of course, getting the band back together. 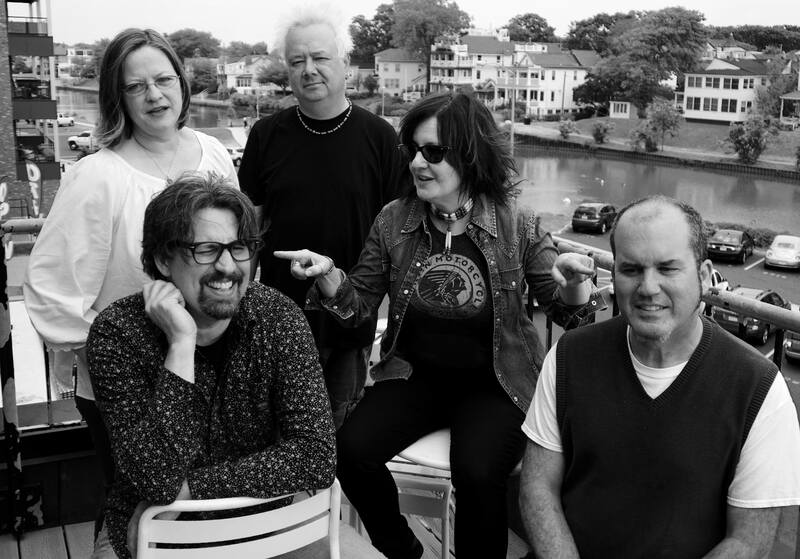 Kath Galasso: It’s been a while for the band, then the clouds parted and you all got back together and came up with a new album that’s very, very cool. Fate is a weird thing don’t you think? Linda Roy: It is a very weird thing because we had a number of false starts. We kept trying to do a project together and the timing just wasn’t right. We couldn’t all schedule it, then it kind of happened at the right time and we were writing the kind of stuff we wanted to be writing. So this is even closer to what I wanted to do initially than anything we’ve done before. We’ve come close before but I’m the happiest and proudest of this project. What was it like going back to Cleveland for your CD release show? It was a really nice reunion. It kind of felt like a wedding reception with a lot of people you know from all parts of your life and some new friends too, and some new people that we met that were just getting to know our music. There was just a real good energy in the room and it was good to play together again. We had some guest musicians too from previous line-ups of the band and some musicians that sat in with us. Were there a lot of the old fans? Yeah and you know what too, we’re getting new people that knew about us from the music scene who were newer at the time that we left, that had heard about us and heard our music. And the children of our members and their friends, so we’ve got a new generation of fans and that’s good too. It was a nice rush to realize that because we were thinking that interest was going to be specific to our age group and was not going to translate to another age group. The appeal seems to be crossing over. Your music is definitely getting a newer generation attached to it. I think because there’s not a lot of choices out there. There’s country, pop, hip hop and rap. Then there’s Americana and roots and I think a lot of people feel that. Yeah, and I’m glad for that too. When we were doing this in the 90s everything was grunge, and we had our own grunge moment. But we were going to do what we do and hope that everybody else comes around to it. It took twenty years but we’re glad that people are into that kind of music. How do you even relate to that it took so many years for your music to become relevant more so than when Jehova Waitresses started? How did the Entertainment Weekly Best Band Name happen? Somebody just told us about it. I think it was our manager. He said ‘hey have you seen Entertainment Weekly? You guys are the best band name.’ We had nothing to do with it. We were totally surprised. Tell me a little about Route 5. I think the tracking is excellent on this album. How did you work to get the flow so well and talk about the inclusion of the instrumental “Mija” on the album. The thing with the instrumental was Kevin wrote that and he was having trouble coming up with lyrics. Or the lyrics he came up with, he was not liking the direction they were going in. So I said to him ‘you really don’t even need lyrics on this song.’ It’s really visual and sometimes we’d do instrumentals. We’ve done them in the past and I just thought it was best without lyrics. Just immerse yourself in the instrumental of it. As far as the flow, Kevin is really responsible for that. He puts together a set list and he put that playlist together. Starting off with “You Don’t Know What You Don’t Know,” we thought we’d start off with a bang and intersperse some humor like “The Banana Song” and finish off on a good note with “100%.” Put in a little introspection here and there. We always like to weave our songs in and out with Alan’s songs. He had two contributions to the album. We really like “The Solstice Song.” He recorded that with his band Sputnik and we liked it so much. So that’s how the flow worked, just weaving everybody’s songs in and out, and trying to strike the right balance with humor and introspection and political commentary. Let’s talk about “Mercy Marie.” How did the storyline for the video come about? In the political climate we’re in now where we’re going backwards instead of forward, has there been any blow back about it? No and that’s been a really nice thing. Nobody has given us any kind of push back on that at all. In fact, one of the film festivals that the video was accepted for, we were nominated in a LGBTQ category, so that was nice. I’m hoping that brings about a whole new audience for us and also can help bring a positive face to the community that so many people are being negative towards. I’m happy to be a part of that. Let’s talk about your vocal style. You have a different voice, not the everyday girl-singer-in-the-band voice. You’re somewhere between Dylan and Petty and a little of this and that. Well, you just kind of find your voice and like you said it, I think it really comes from a combination of your influences and then you. It’s stirred up in that pot. I always think about Paul McCartney, how he wanted to be, when he was singing “Let It Be,” he wanted to be Ray Charles. It came out as Paul McCartney but in his head it was probably Ray Charles. For me, yeah some of my biggest influences are Bob Dylan and Tom Petty, Linda Ronstadt, Stevie Nicks and Chrissie Hynde. I’m kind of a mix of all my influences. Let’s talk a little bit about Tom Petty and losing him. I know he was an incredible influence to you. Does his death influence you as a songwriter going forward and tell me what the loss means. I always wanted to do music but being in a band…that’s a funny thing. Kevin always tells me too, it’s not like you approach it like a girl in a band. Even though Chrissie Hynde is a big influence on me, Tom Petty was always a bigger influence. So I define myself as one of the guys in the band. I always joke about wanting to have a Tom Petty tribute band and I don’t even think about the fact that it would be fronted by a woman. He is a huge influence on me and my style of writing. Just that it’s timeless rock and roll and that band, The Heartbreakers is the best band. There are many great bands but they will go down as one of the greatest because they can play anything. Any style of music and make it their own, and make it fantastic. It was a huge loss for me. I feel like I’ve lost a member of my family. He was a class act. As far as songwriting, I always think about his style of songwriting. He used to say ‘Don’t bore us, get to the chorus,’ and I agree. It seemed so effortless. His songs, they’re simple and simple is good. If it was a rocking electric song he could play it on an acoustic and it would still be good. As a songwriter, so many points were checked off the list with Tom Petty. It doesn’t get much better than that. 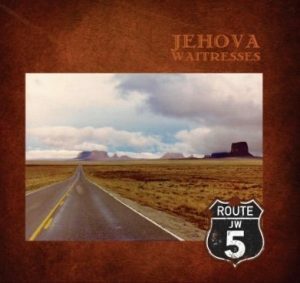 As Jehova Waitresses plan for spring and summer shows, Route 5, released through 2folkedup records, is currently gaining airplay on a national level. Route 5 Debuted in Top 10 on WLFR Galloway, NJ (#7) and #18 on WRRG River Grove, IL. Other stations where you can hear Route 5 include: WPTS Pittsburgh, PA ; WWUH West Hartford, CT; KSYM San Antonio, TX; KAOS Olympia WA; KRUX Las Cruces, NM; WDWN Auburn, NY; WMUL Huntington, WV ; WRUW Cleveland, OH; WVUD Newark, DE; KRBX Boise, ID; WDCE Richmond, VA; WMXM Lake Forest, IL; WXIN Providence, RI; KRNU Lincoln NE; WAWL Chattanooga, TN ; WMUC College Park, MD; KCSC Chico, CA and WLUR Lexington, VA. Check out the Jehova Waitresses website for show information and for sales outlets.